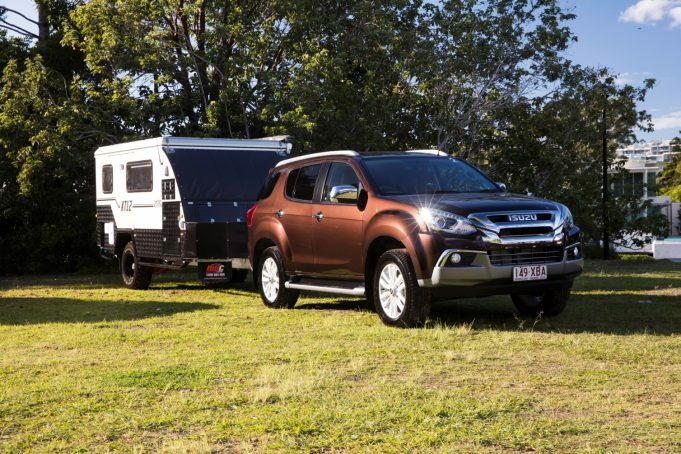 ISUZU Ute Australia has launched its newest tool in its quest to achieve a decade of double digit growth on the Australian market, the updated MU-X. It was only a couple of months ago that Isuzu Ute Australia (IUA) upgraded the drive train of the MU-X when it rolled out the Euro V compliant 3.0L inter-cooled turbo diesel, but the MY17 version of the SUV is a significant step up from the MY16 and even the MY16.5. Mechanically, the MY17 MU-X is the same as the MY16.5 version, but IUA has excelled in interior improvements, boosting comfort and noise levels and a striking new look. Styling is refined, yet still tough looking and there’s now a clear differentiation between the ute and SUV with MU-X’s new headlight assembly featuring Bi-LED projector headlights. Mitsubishi Pajero Sport is the only other model in the class to deviate away from Halogen lights. The new lights are brighter and travel an extra 20-metres up the road and also feature auto-levelling when there is a load on the back. The rear picks up a new tail light design, including LED positioning lights while for the LS-T there’s also a newly styled rear spoiler. It’s not the styling that makes the 2017 MU-X an even bigger threat to its competitors – it’s the interior changes and new levels of sound insulation. IUA has been hammered in the past for its use of hard plastics in the D-Max and MU-X (including by Exhaust Notes Australia in our review of the D-Max LS-Terrain last week), as well as noise levels in the cabin. Internally prepared results of the MU-X customer satisfaction ratings highlight two weak points for IUA, with only two scores sub 90 per cent: interior design at 89.5 and engine noise at 82.1. It’s these scores that led the MU-X’s new interior design which is highlighted by new textures and materials throughout the cabin. The upper glove box, dashboard visor, door armrests and centre console all get soft padding, while the hard plastic of the dash gets a softer looking texture. To tackle the engine noise, Isuzu has gone to town with insulation to all areas of the car: the firewall, behind the dash, air vents, through the transmission tunnel, under the lower edge of the windscreen and increasing the density of the base floor – changes that are exclusive to the Australian export market. The result is an average of five per cent across the rev range or three decibels – which may not sound like much but it’s important to understand that it’s not a linear scale. Three decibels is a huge reduction. Like previous renditions of the MU-X, there are three variants available in both 4×2 or 4×4: the entry-level LS-M, mid-spec LS-U and top of the line LS-T. The entry-level receives a new 16-inch wheel while the two other models get a new 18-inch alloy, both fitted with all-terrain tyres. The new Aisin six-speed automatic transmission with lock up torque converter is available across the range, while a six-speed manual exclusive to Isuzu is available in the LS-M and LS-U. IUA is a true success story of recent times, aided by the introduction of the MU-X in 2013. While it was a soft launch for the SUV in late November of that year, with just 120 sales, it was followed by 4,625 in 2014 and 6,344 in 2015. Last year the MU-X climbed the sales ladder to sixth in the large SUV class with 7,018 units – up from ninth the years before. It’s now hot on the heels of fifth placed Hyundai Santa Fe, which sold 7,834 units last year. IAU CEO and managing director Yasuhiro Takeuchi announced what was believed to be an ambitious sales target of 2,700 per annum at the initial launch and a sceptical media asked how this would be achievable. It speaks wonders about the brand and its lack of arrogance that Isuzu Ute Australia isn’t coming out and telling the market what it wants, but rather is asking the market (and media) what they should be improving. The 2017 MU-X model range features six colours: Cosmic Black, Obsidian Grey, Silky White pearl, Splash White, Titanium Silver and the newly introduced Havana Brown. Exhaust Notes Australia is glad to see the Outback Bronze colour omitted, but we feel it lacks a red like D-Max’s stunning Venetian Red. The MU-X also gets Isuzu’s new Service Plus 555 program – which includes five year/130,000km warranty, five year/50,000km fixed price servicing and five year road side assist. Pricing for the 4×2 MU-X starts from $42,800 to $48,800 while the 4X4 starts from $48,100 and peaks at $56,100.